Why do we at Emed consider this approval so important? Simply put it boils down to increased availability and utilisation thereby maximising the therapeutic value of these important nutrients. 5-methyltetrahydrofolate (5-MTHF) is now legally listable in Australia after an application with the TGA. It is a big win for the industry and Metagenics (Health World) was the company who drove the application, allowing the rest of us to benefit. 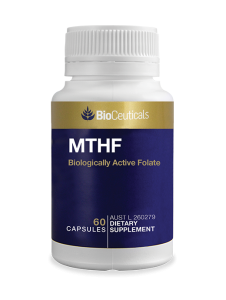 5-MTHF is the most active metabolite of folic acid (vitamin B9) due to its ability to bypass all of the enzymatic activation steps in the conversion of folic acid to the biologically active 5-MTHF. 5-MTHF has important advantages compared to synthetic folic acid. It is well absorbed even when gastrointestinal pH changes. It is bioavailable and not affected by metabolic defects. The use of 5-MTHF to replace folic acid in treating MTHFR genetic defects in particular, reduces the risk of masking symptoms of vitamin B12 deficiency ( as evidenced in blood), reduces interactions with medications inhibiting the enzyme dihydrofolate reductase, prevents formation of unmetabolised folic acid in blood circulation and overcomes metabolic defects caused by the MTHFR mutations. DNA replication through healthy DNA methylation. Maintenance of normal blood by helping to form red blood cells and assisting with their function. The normal growth of a foetus with a 500mcg daily dose of 5-MTHF. If taken daily for one month before conception and during pregnancy 5-MTHF may reduce the risk of women having a child with birth defects of the brain and/or spinal cord such as the neural tube defects known as spina bifida and anencephaly. 5-MTHF now available on Emed include Research Nutrition L-5MTHF and BioCeuticals MTHF. Methylcobalamin is the form of B12 that is active in the human body as it bypasses the conversion requirements of the cyanocobalamin form. It is a coenzyme forms of B12 that is active in human metabolism. Maintaining a healthy nervous system and nerve function. Supporting healthy plasma homocysteine levels – therefore it is cardio protective. DNA synthesis and normal cell division. Normal healthy red blood cells. To date in Australia most of our vitamin B12 supplements contained the cyanocobalamin form. Normally the liver is able to convert a small amount of cyanocobalamin to methylcobalamin; however methylcobalamin is the preferred form since it is the bioactive form of vitamin B12 and therefore better utilised. This improved utilisation is indicated by human urinary excretion of methylcobalamin which is about one-third that of a similar dose of cyanocobalamin, indicating substantially greater tissue retention. In the blood, methylcobalamin comprises 60-80% of total plasma cobalamin. Vitamin B12 is the cofactor in enzymatic reactions and has a number of important functions. It is required for the conversion of methylmalonyl CoA to succinyl CoA, as well as the conversion of homocysteine to methionine by methionine synthase, which is then converted into S-adenosylmethionine. A B12 deficiency causes impairments in both of these important pathways. Consequently neurological function is disrupted (including poor formation of myelin nerve sheaths), there is production of toxic levels of homocysteine and inefficient energy production in all cells. Cobalamin is required to remove the methyl group from methyltetrahydrofolate and generate tetrahydrofolate, a necessary step in DNA synthesis. As a consequence, B12 deficiency affects the growth, function, and repair of all cells, the most apparent sign of which is megaloblastic anemia, caused by inhibited mitosis of red blood cells. 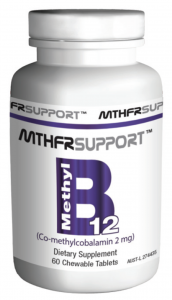 Methyl B12 supplements now available on Emed include MTHFR Support Australia Methyl B12, BioCeuticals Liposomal Methyl B12 and BioCeuticals Methyl B12 Chewable. One of the ways in which B12 is absorbed is by passive diffusion across mucosal membranes. B12 sublingual (under the tongue) supplementation is therefore an effective delivery method and carries the added benefits of lower cost and ease of administration. Sublingual B12 is suitable for population groups at increased risk of vitamin B12 deficiency, including the elderly, those with malabsorption issues, poor dietary intake, those with a fear of needles and vegetarians. The dosage for clinical effect is 1000-6000mcg per day. No significant therapeutic advantage appears to occur from dosages exceeding this maximum dose.